Marketing professor, author, speaker and consultant. Tim Calkins is a marketing professor, author, speaker and consultant. He is Clinical Professor of Marketing at Northwestern University’s Kellogg School of Management. He teaches courses including Marketing Strategy and Biomedical Marketing in the full-time, part-time and international executive MBA programs. He is co-academic director of the Kellogg on Branding executive education program. Tim won the Lawrence G. Lavengood Outstanding Professor of the Year Award, the top teaching award at Kellogg, in 2006 and 2013, making him one of just four people in the award’s more than forty year history to have won it twice. Poets & Quants included him on its list “Favorite MBA Professors of 2016.” He also received the Sidney J. Levy Teaching Award, two Kellogg Faculty Impact Awards and the Kellogg Executive MBA Program’s Top Professor Award four times. 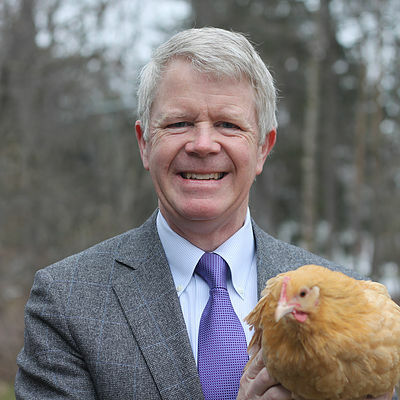 He is the author of the new book, How to Wash a Chicken – Mastering the Business Presentation. Tim also wrote Defending Your Brand: How Smart Companies Use Defensive Strategy to Deal with Competitive Attacks (Palgrave Macmillan, 2012). Expert Marketer Magazine named Defending Your Brand the 2013 Marketing Book of the Year. He also wrote Breakthrough Marketing Plans (Palgrave Macmillan, 2008 and 2012) and was co-editor of Kellogg on Branding (John Wiley & Sons, 2005). He has published more than a dozen Kellogg case studies including Crestor, MedImmune: FluMist Introduction and Genzyme: the Synvisc-One Investment Decision. He has authored more than two dozen articles on marketing topics. In addition to teaching at Kellogg, Tim works with major corporations around the world on strategy and branding issues. His recent clients include Pfizer, PepsiCo, Lifelock and AbbVie. He is managing director of Class 5 Consulting, a marketing strategy firm. He serves on the board of the Alliance Française de Chicago and completed two terms on the board of the Lycée Français, Chicago’s French-International School. Tim began his career at the consulting firm Booz Allen and Hamilton, where he worked on strategy projects. He joined the marketing team at Kraft Foods in 1991. During his almost 11 years at Kraft, he led brands including Miracle Whip, Taco Bell, Parkay and DiGiorno. He was responsible for the launch of more than two dozen new products. He received his BA from Yale and his MBA from Harvard. Tim lives in Chicago with his wife and three children, and no chickens.